I know your fur baby means the world to you! I want to help you find a way to tell their unique story and showcase their lovable quirks and personality. Meet Boris, our beautiful adopted domestic short-hair. Our pets provide those moments of pure joy when they greet us with unconditional love after a long day. They are loyal and they make us smile. They mean so much to us, and as an important member of the family they deserve to be celebrated and admired! 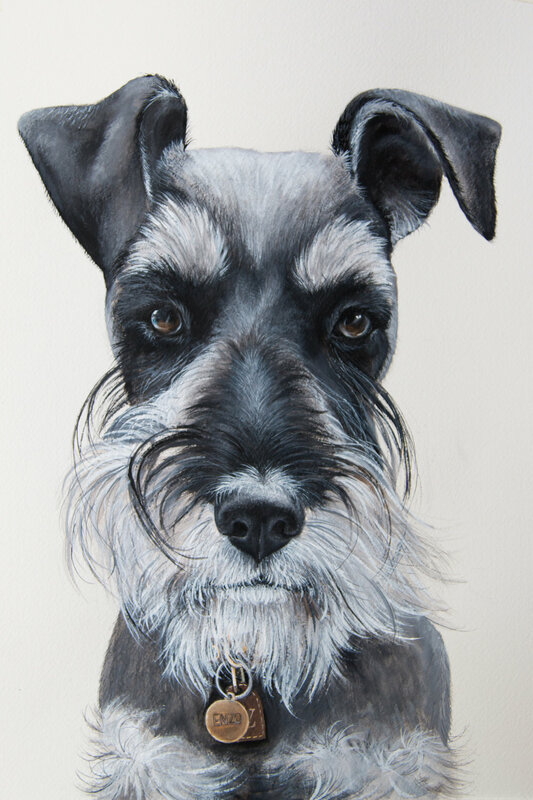 I adore painting animals, and as a Pet Portrait artist I take special care to capture the unique personality, quirkiness and oddness that you cherish about your pet. Since I'm creating a memento which will last forever, I want to work with you and get to know about your pet. How do they make your life better? What is it about them that makes them totally unique? I like to be really clear on what you're imagining and how you would like me to capture your pet's personality, so I'm always happy to discuss what you're looking for on the phone and to help you get the best photos for your pet's portrait. If you're pet has sadly passed away, I understand if you can only provide certain photos and I will do my best to work with with you to create a portrait to celebrate the life and your memories of your beloved pet. Get in touch via the Order a Pet Portrait button below to tell me about your furry friend and I will contact you to get started. I paint portraits from your favourite photos in watercolour on thick 300gsm Arches paper, or in Oil on beautiful birch wood panels. See the FAQs below for more info about oil paintings and how to order. How do you create the portrait? Do you take the photos? All portraits are created using photos provided by you. I require at least one high resolution photo of your pet sitting up, with clear detail of the face (especially the eyes), plus one or two more for a better idea of how your pet looks in real life. I'm always happy to provide tips on how to get the best photos for your pet's portrait. Yes! Click HERE to see more of my portraits in my portfolio. What mediums/materials do you use? I use Winsor & Newton or Art Spectrum paints. Watercolour pet portraits are painted on Arches 300gsm cream cotton paper (this paper is acid free and lasts forever). Oil portraits are painted on beautiful birch wood panels. How long will a portrait take? Watercolour portraits take approximately 2 weeks to complete, however if you need one done quickly let me know and I will do my best to get it to you sooner. Oil portraits take approximately one month to complete. Shipping costs start at $12 (registered within Australia) for watercolour paintings on paper, overseas shipping costs start at $20. I can give you a full quote once you know what size/medium you would like. For oil paintings shipping starts at $20 due to the weight of the wood panel. How is an oil painting different to watercolour? Oil paint creates a beautiful rich finish resulting in an image which practically jumps off the canvas. Oil paint can be applied in many different layers which allows for a lot of detail that can be impossible to achieve with watercolour paint. I will also paint a coloured background for an oil portrait, and since a wood panel is used the painting is ready to hang as soon as you receive it, or you can choose to have it framed. How do I order an oil portrait? Please let me know in the order form if you would like an oil portrait created and I can give you a custom quote. Prices start at $450 for an 9 x 12 inch portrait. Oil portraits take approximately one month to complete due the the extra drying time for the paint. "I would thoroughly recommend Zoe to anyone looking to get a portrait of their beloved pet. Zoe has accurately captured all of my much much loved Greyhound's features in the portrait. She has also made sure the portrait gives a great sense of Jake's happy playful spirit. Family and friends have commented how beautiful the work is and I must say I love it and will cherish it forever. "Zoe did an awesome job of painting Gibbs! Gibbs is such a dag and Zoe was able to capture his personality perfectly in the painting. I love this painting so much!"